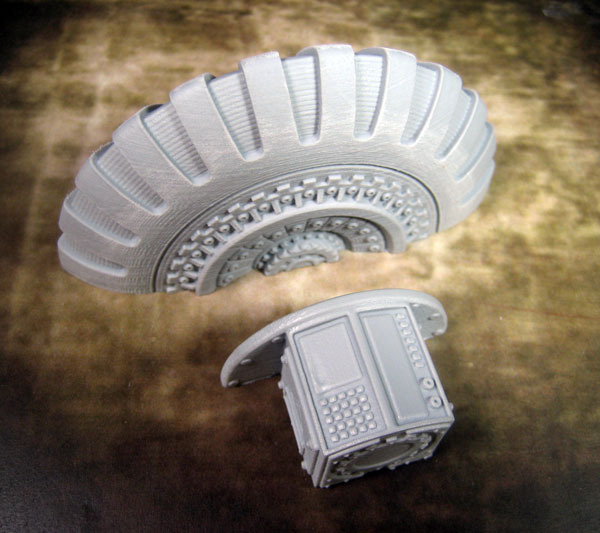 Great flexibility for use as terrain features for sci-fi and steampunk settings -- versatile for different settings with some different painting color choices, and which elements of the model you decide to draw attention to through emphasis. The "gear tooth" elements to the engine itself invite use for a steampunk setting or "magi-tech" world (e.g., Warmachine / Iron Kingdoms). For higher-tech, painting up the recessed sections neon blue (as in the sample photo) can give it a sci-fi or cyberpunk look. However, for a more "industrial"/retro-tech look, those ridged areas in the gaps could be painted up as exposed sections of copper wire bundles. I could see myself going back to this piece and repainting it to fit in with a number of different game systems/settings.